I am coming to believe that Chili Cheese Toast (abbreviated to "CCT" on some menus) is one of the world's great snackfoods. It summons the "cheese-on-toast" of my youth, with the bonus addition of chili heat. It is made with a mild cheese slice laced with ringlets of fresh green chili, all melty on top of a unwholesome tranche of sweet white sandwich loaf. This CCT interpretation from our hotel in Madurai was slightly unorthodox; more baked cheese spread than pure cheese. 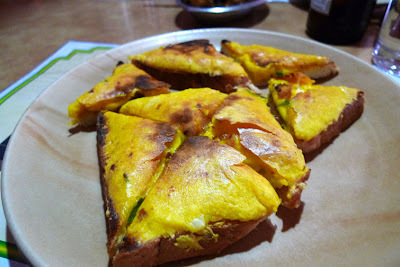 Somewhat like a thick cheesy bechamel laced with turmeric, and broiled until a thin crust formed on top of the gooey mustard-yellow viscosity of the filling. I approved. This one from the Carlton Hotel in Kodaikanal was a more straight-laced rendition. Somewhat uninspired but still well snackable. I'm thinking Chili Cheese Toast could be jazzed up into a more modern fingerfood as a crispy layer of parmesan or beemster or Thunder Oak gouda, on a superthin slice of crusty baguette, with green chili and/or some nice chili powder on top. Or maybe do away with the baguette all together, just go for a cheese basket with a little chili treat inside.